I am recently into crepe cakes. I made my first one about a month ago, and I fell in love. It was always something I had wanted to make, but never got around to it. I thought it would be too time consuming, so I always brushed it off. That is until now. I tried making one and it was pretty simple. In the time it would take to bake a regular cake, I had all my crepes done! I veganized a crepe recipe I used to use, changing it quite a bit and they turned out delicious! I would eat these for dessert or breakfast if I was feeling decadent. I ended up with one small one and it became my snack. The rest were destined for cake as tempting as it was to just eat them. I decided to layer them with bananas, caramel and cream. 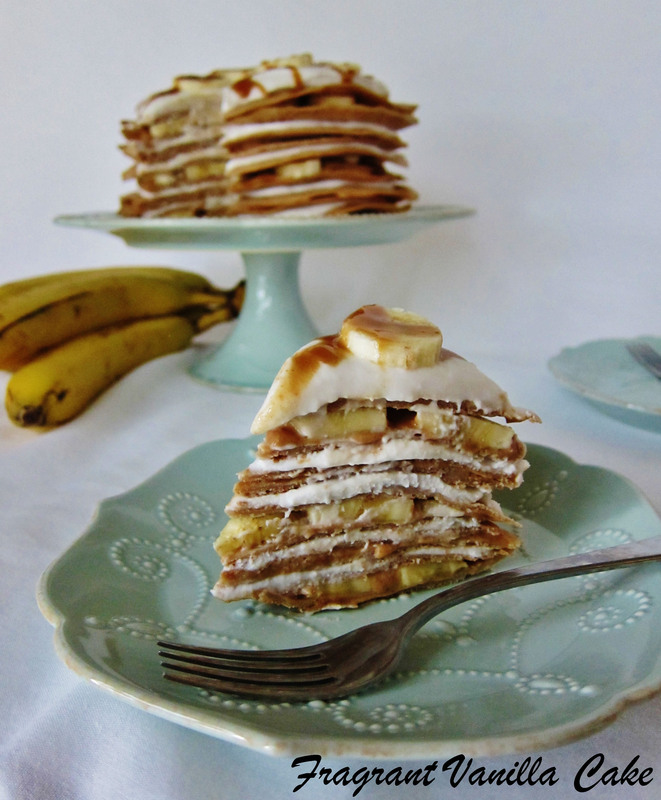 Sort of like banana cream pie with caramel crepe cake. 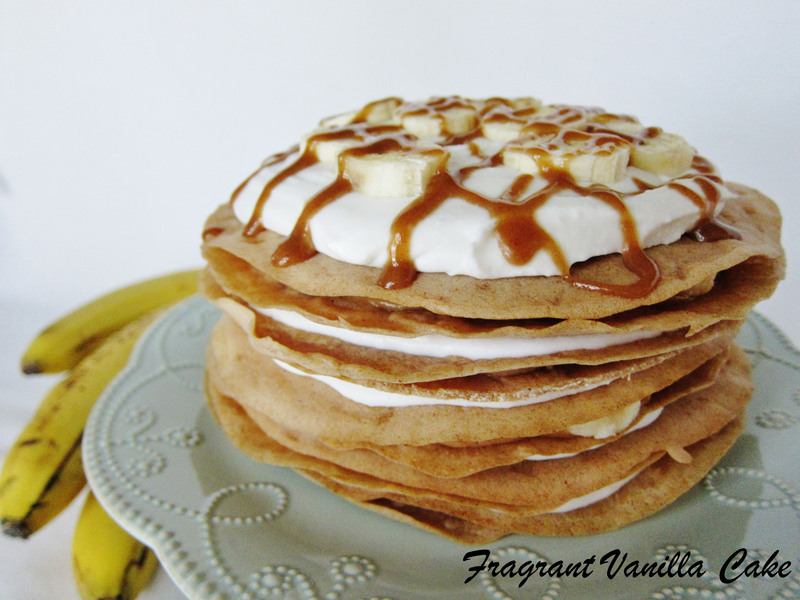 I made a simple banana caramel, using the bananas as part of the sweetening element because they are so delicious. 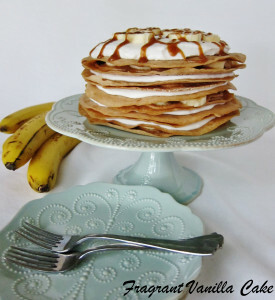 And a simple vanilla coconut cream to layer it with along with the bananas. I love that this cake is not fussy. 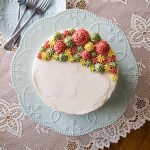 You do not have to sit and smooth the cream and make sure it looks perfect and even since the nature of this cake is a little free form. There it stood, all delicious looking and ready to eat. I could not wait to dive in. 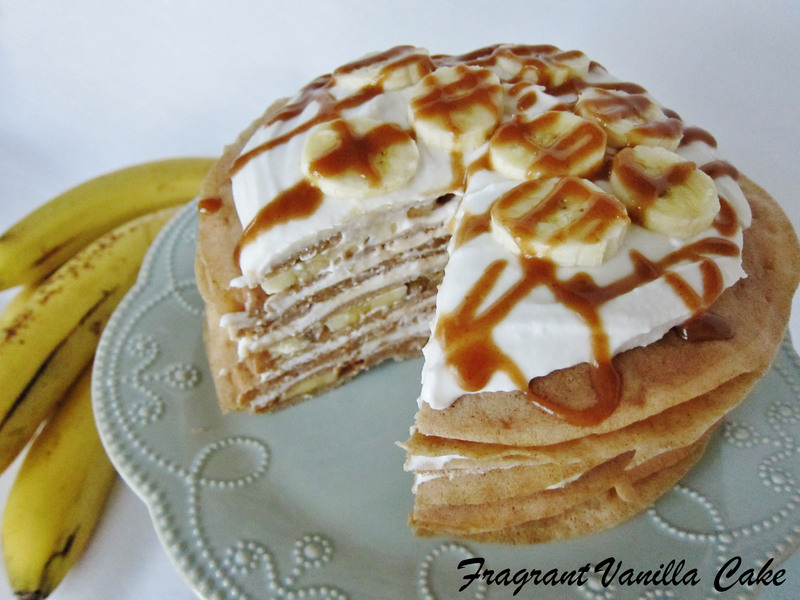 I love banana cream pie, I love caramel and I love crepes. This could not have been more exciting. It was sooo good! 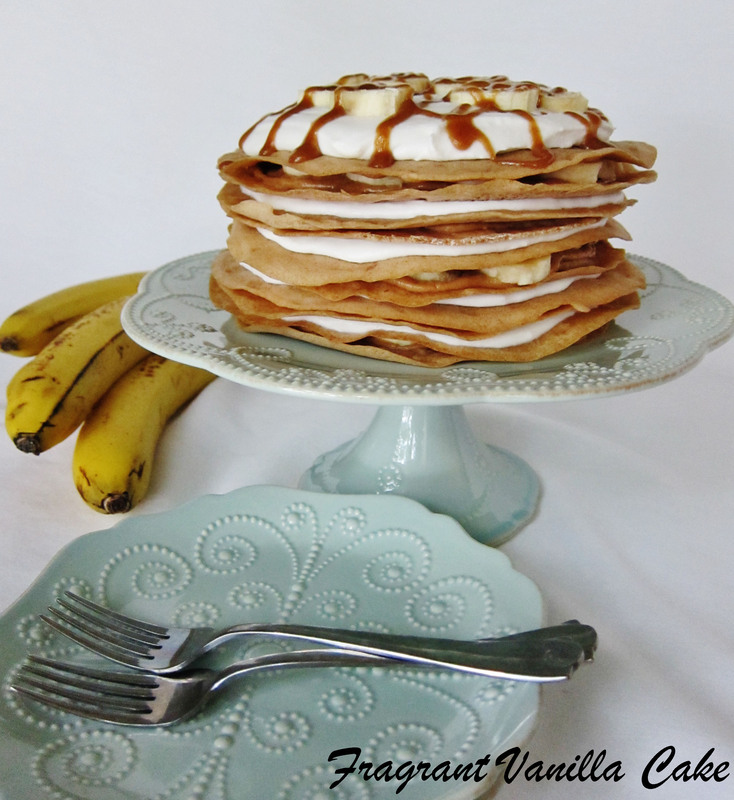 If you have never made a crepe cake, you must try, trust me, it will make you and those you share it with so happy! 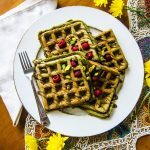 To make the crepes, mix together the flaxseed and water in a bowl, and set aside in the refrigerator for 15 minutes until it is the consistency of egg whites. Heat a non-stick 6 inch pan over medium heat, then pour in 1/3 cup batter, and swirl the pan so that it spreads out to the edges. Cook for about 3 minutes on the first side, then flip over and cook the second side. Once the crepe is done, set aside on a plate. Repeat with the remaining batter, separating the crepes with parchment paper on the plate so that they don't stick together. Once you have finished allow them to cool completely. To make the cream, combine the coconut milk, maple syrup, vanilla and sea salt in a food processor and process until smooth. Then, slowly with the motor running, add the coconut butter through the feed tube (you don't want the mixture to separate and clump up. But if it does, just continue to blend until smooth (it will be liquid at this point), then place in the freezer and allow to chill until thick) until the mixture is thick. Set aside in a bowl in the refrigerator. To make the caramel, blend everything in the blender until smooth. Set aside. 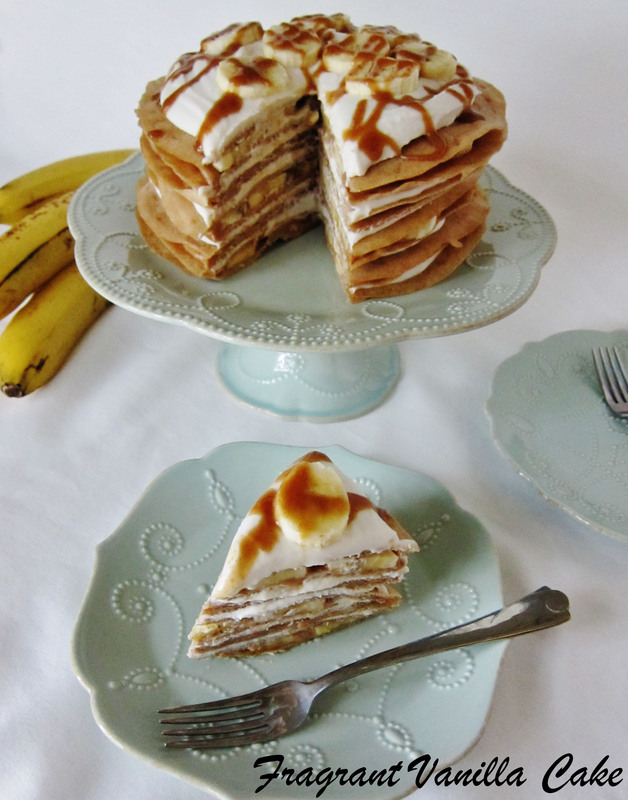 To assemble the cake, place one crepe on a plate, then spread some of the cream over that in a thin layer, then top with another crepe, and spread a layer of caramel over that then a layer of thin banana slices. Repeat the layers until you get to the last crepe then top the cake with the remaining cream. Garnish with banana slices and any remaining caramel (I thin it out with a little water to make it easier). 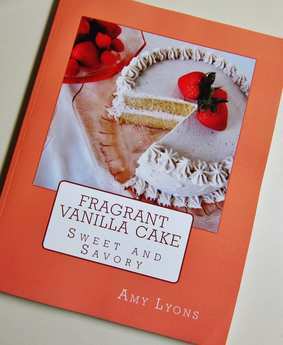 Let the cake set in the refrigerator for at leas an hour before cutting. This looks sooo decadent! So many of my favourite flavours...caramel, banana, coconut. This would be an amazing birthday breakfast! Thank you :)! Yes, I totally agree! This looks amazing. 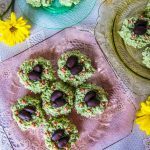 Do you ever use aquafaba instead of flax? I'm wondering how it would go in crepes because it's so egg white like? 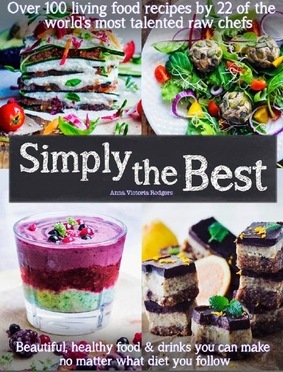 I have in other recipes, but not for these. I would think it would work.